I am the undisputed Queen of Stripped Screws. I strip screws with a manual screwdriver because I don’t have a lot of strength in my hands. I bought Mommy’s Little Helper, my mega torque electric drill, hoping the extra torque would solve the problem. I still strip screws from time to time but now with turbo! After some research, I realized that electric drills commonly strip screws. What I should have been using all along is an impact driver. Unlike an electric drill, an impact driver is made to do one thing and it does it very well: drive screws and hex nuts. It is less likely to strip screws. I say less likely because if you are the Queen of Stripped Screws, you will find a way to strip one when normal people will not. I consider it my gift, my curse. Unlike an electric drill, an impact driver drives the screw by both rotating the drill bit and using concussive blows. Moreover, if you are the Craftsman NEXTEC 12.0 Volt Right Angle Impact Driver you can do it tight little spaces. This is a right angle impact driver. The Craftsman NEXTEC 12.0 Volt Right Angle Impact Driver to exact. I found it to be the perfect tool for installing the screws for my curved curtain bracket because my electric drill won’t reach. I’ve tried using a long manual screwdriver but it is impossible to keep on the screw head for more than a few turns at a time and I don’t have the strength in my hands to drive one of those screws into a wall stud. The Craftsman NEXTEC 12.0 Volt Right Angle Impact Driver is related to the Craftsman Hammerhead Auto Hammer I reviewed. Like the Auto Hammer there may be some confusion about what this powerful and lightweight little tool is designed to do. Craftsman NEXTEC 12.0 Volt Right Angle Impact Driver is not an impact wrench (also known as an impactor, air wrench, air gun, rattle gun, or torque gun) which is commonly used in auto shops to loosen and tighten lug nuts as well as drive screws. Impact wrenches generally need to be connected to an air compressor to work. The Craftsman Right Angle Impact Driver does not. It runs off a 12 volt rechargeable battery. The Craftsman NEXTEC 12.0 Volt Right Angle Impact Driver is also not a hammer drill (also known as a rotary hammer, roto-hammer or impact drill.) Hammer drills are used to drive into material like stone or to break through concrete. 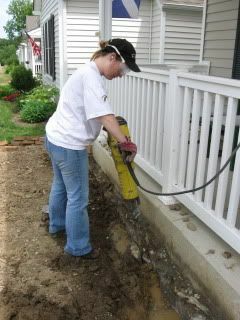 Me using the mother of all hammer drills to break up concrete in my flower bed. Generally, we refer to this size as a jackhammer. It was crazy fun to use! The Craftsman NEXTEC 12.0 Volt Right Angle Impact Driver will drive hex nuts as well as screws. The Craftsman NEXTEC 12.0 Volt Right Angle Impact Driver is the most powerful and lightest weight right angel impact driver when I compared it to the store display of a Hitchati and a Ridgid right angle impact driver. The Craftsman and the Hitchati were approximately the same weight. However, this short woman appreciates that the Craftsman impact driver isn’t as monster heavy as the Ridgid. The Ridgid is the heaviest of the three. The Craftsman is also the most powerful of the three right right angle impact drivers. The Craftsman has 700 pounds of torque, followed by the both the Hitachi and the Ridgid which both have 650 pounds of torque. The NEXTEC 12.0 Volt Right Angle Impact Driver is great for tight spaces. I can see using it for future bicycle maintenance especially. The Craftsman NEXTEC 12.0 Volt Right Angle Impact Driver came with several size heads for hex nuts but only one screwdriver bit, which is what I’d use it for the most. Regular Craftsman screwdriver heads should not be used in the Impact driver because they aren’t made to withstand the concussive force of an impact driver. However, Craftsman told me they will have sets of impact driver screw heads for sale in November. But for the $99.99 price tag, I think they should be included. It comes with only one rechargeable battery. The battery charges quickly and holds its charge for longer than my initial test period. You can buy extra batteries from Craftsman. Would I Buy a Craftsman Impact Driver? I’m not afraid to give a tool or anything I review for that matter a thumbs down if it doesn’t work for me. I wondered if the Craftsman NEXTEC 12.0 Volt Right Angle Impact Driver would just be a nifty toy to have instead of something I would use for jobs other than curtain rod brackets since I already have an electric screwdriver, which kinda stinks so I don’t use it. Given that the Craftsman Impact Driver is designed so stripping screws is less likely than an electric drill, that it is also less likely the slip off the screwhead and make accidentally countersinking your thumb less likely (trust me that’s a good thing.) I’d buy the Craftsman NEXTEC EXTEC 12.0 Volt Right Angle Impact Driver for the handywoman who doesn't have the strength in her hands (or desire) to drive screws with a manual screwdriver, the older handyman who's losing strength in his hands, or anyone who wants to drive screws the easy way. Disclosure: Craftsman supplied me with NEXTEC 12.0 Volt Right Angle Impact Driver to facilitate this review. I went to a home improvement store on my own to compare it to other tools. All opinions are my own and longtime readers know I am very opinionated. Five Toilet Paper Roll Crafts and a Contest!